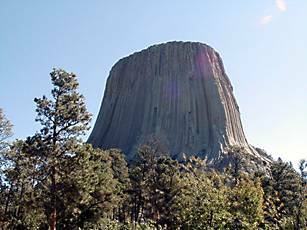 Devils Tower is a monolith located near Hulett and Sundance in eastern Wyoming. It rises dramatically 1267 feet (386 m) above the surrounding terrain. In 1977 it was used as the location for the finale of Steven Speilberg's film Close Encounters of the Third Kind. "They found the passage strewn with bones. Perhaps human bones. At the end, the tunnel opened up into a cave with an underground lake some 25 yards long and more than 15 yards wide. Around the lake were large quantities of gold."